When we first reported yesterday that a Motorola XOOM update would be made available today, we were sort of confused about one of the new enhancements included in it – the new “picture transfer protocol.” We kept wondering how this was going to work, but the answer is now obvious thanks to a couple of tips from some VZW friends. 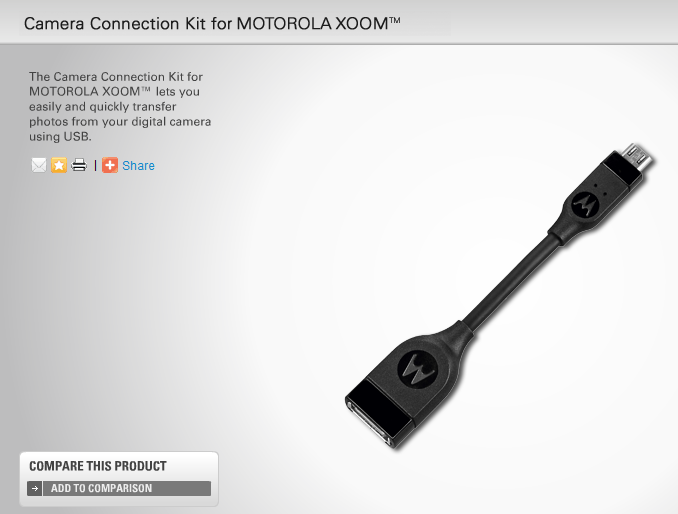 Motorola is introducing a XOOM Camera Kit that is available for $19.99 and can be ordered if you ask a Verizon rep to use item#: MOTMZ600ADPKIT. We say to ask a rep because the accessory is not yet viewable online, but we’re being told that it’s definitely in stock and can be ordered.